Until late 1984, I continued to publish in a wide range of art magazines and journals of cultural critique, having served on editorial boards of FUSE, The Body Politic, and Fireweed — magazines with international reach produced in Toronto. The two issues of Artforum pictured above — April and May, 1981 — contained my reviews of the Gerry Schum retrospective organised by the Stedelijk Museum, Amsterdam (1979/80) and of an exhibition by John Scott at Carmen Lamanna Gallery (1981). Gerry Schum’s pioneering ‘tv gallery’ in Dusseldorf ran from 1968 to 1973 — and even the retrospective I wrote about then is now so long ago that there has been another one since: at Kunsthalle Dusseldorf in 2003. In John Scott’s 1981 show of amazing drawings of the military-industrial complex as a science-fiction, there was a prescient drawing of a man overwhelmed by numbers, a drawing entitled ‘The Googleplex’. 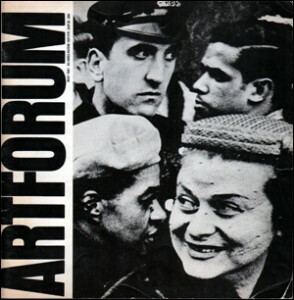 I wrote a number of other reviews for Artforum in that period, about Colin Campbell, Robert Bowers, David Clarkson, Genevieve Cadieux, and others. 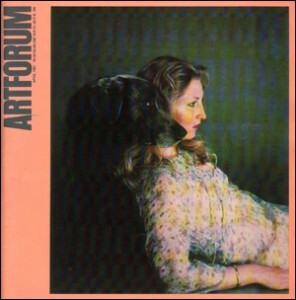 But for any writer, the most important part of publishing is working with exciting editors: at Artforum I was edited by Ingrid Sischy and David Frankel. Good editors are your best friend. And indeed some of them became close friends, like Martha Gever and Catherine Lord who taught me so much, and who were working at Afterimage in the 1980s. I published articles about Arnaud Maggs (January 1982), and Karl Beveridge and Carole Condé (November 1982) in Afterimage. 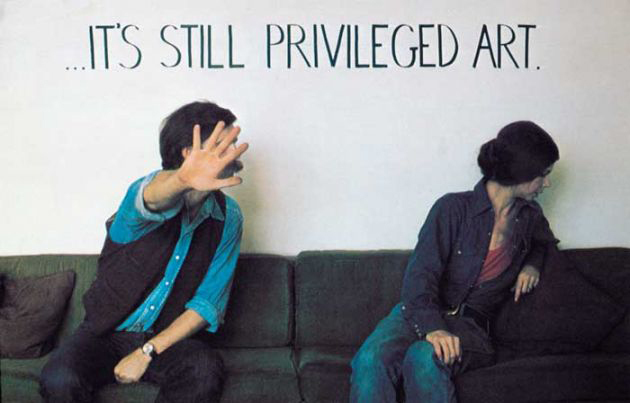 The article about Karl and Carole, entitled “The Production of Meaning,” also appeared in Open Letter and in issue 8 of BLOCK, which pioneered critical inquiry into the rapport between politics and aesthetics, and was edited by Lisa Tickner and others. Canada had its own publications of distinction in this field, and some of them are still going strong. When I was on the editorial board of FUSE Magazine on the cusp of the 1980s, Karl and Carole were closely involved — as was Lisa Steele, Clive Robertson, and John Greyson. In fact, before it was FUSE, it was Centerfold, and that’s when I first published in it. I wrote about Videocabaret, anorexia, copyright infringement of artists’ videotapes, editing the television news, Toronto’s experimental film collective called The Funnel, the girl-band The Slits, and more. 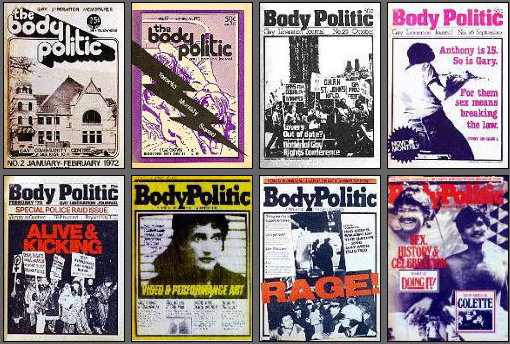 Fully immersed in the political/aesthetic climate, I wrote about artists’ video and about performance for the feminist journal, Fireweed (‘Lisa Steele: Hearing Voices’ Summer 1980) and for the gay liberation newspaper The Body Politic. In fact, when I attended the landmark conference Marxism and the Interpretation of Culture at the University of Champaign Urbana in 1983, I was not surprised to see as many gay rights colleagues as artists and art critics assembled. Thirty years later, there is now an MA in Aesthetics and Politics at CalArts. I became involved in commissioning and editing cultural news for the Body Politic, and was mentored by some very brilliant people there — Rick Bebout, Tim McCaskill and others. Doug Durand and I published an extensive article about gender and performance for the BP, and with that article, the collective put video artist Colin Campbell on the cover (June 1980, see below). In part because of my work with video distribution at Art Metropole, I was very interested in artists working in time-based media, and so I also came to be published in short-lived but influential journals like John Howell’s LIVE, Video Guide, and On TV. The range of art publications, and the different registers within which each approached contemporary art, was much more varied in the 1980s — though the ease and economies of web-publishing over print-bind-and-deliver would have quickly won over most editors from that period. In Canada, the two main publications were produced literally 3,500 miles from each other, in two different languages and pitched at very different kinds of reader. They were: Vanguard, edited by Russell Keziere in Vancouver, and Parachute, edited by Chantal Pontbriand and France Morin in Montreal. I wrote for both. 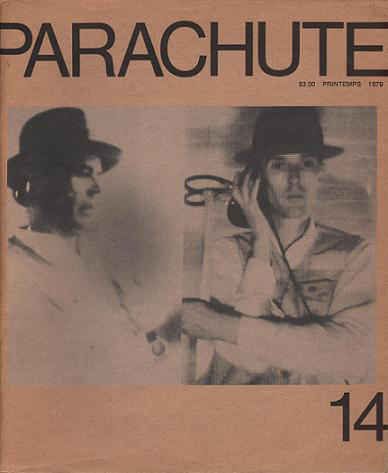 Here is a cover for Parachute issue 14, featuring a 1976 performance by FUSE editor, Clive Robertson, entitled The Sculptured Politics of Joseph Beuys, in which Robertson grapples with the implications — for his own career — of Beuys’ fame. In Vanguard, which ran from 1972 to 1989, I published mainly reviews — Robert Wiens, Brian Boigon, Les Levine, Spalding Gray, Joseph Beuys, Elizabeth MacKenzie, Patrick Jenkins, Rebecca Garrett, Tod Siler, Ian Carr-Harris, Lyn Blumenthal. 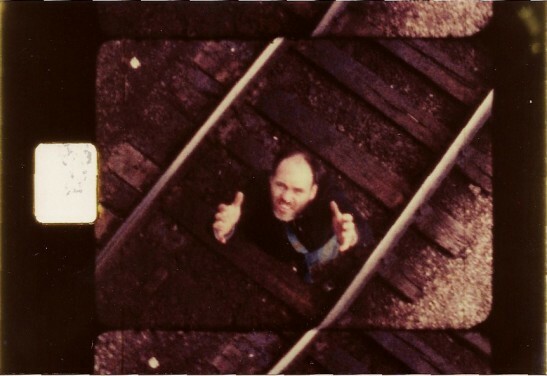 In Parachute, I also reviewed — Joyce Wieland, John Massey, Glass’s Satyagraha — but I most enjoyed writing a full-length article about the relationship between experimental film and architecture: Filming Buildings Building Films (Parachute 25, Winter 1981) It concerned the films of Ross MacLaren and of John Porter, both of The Funnel. I feel it would have come as no surprise to them that I would shortly move from Toronto to Montreal, and that I would spend the following decade fully engrossed in the intersection between art and architecture.